Over the 7 years since I started sharing my artistic journey on this blog, I have deliberately shied away from showing anything controversial or political. I’ve been playing it safe, but not anymore. The recent American Presidential election has jolted me out of my quiet world, into the partisan struggle surrounding us. I believe that we are in the first chapters of an epic cautionary tale, which portends to be an instructional parable and test of our democracy for at least a generation. I cannot sit back and go on as usual, trusting that it will all work out without my involvement. Those pesky fairies are ganging up and insisting that I express my thoughts and opinions through art. They know that is how I deal with distressing events that keep me awake at night. In the dark, I think about and visualize what to make and how I’m going to go about it. It helped me get through election night, when I pictured a huddled group of wee folk under a sheer black shroud. And that is how I will continue to try to comprehend what I see unfolding before us. I have always been inclined toward editorial illustration, but couldn’t figure out how to do the work quickly enough to meet professional deadlines. Now, my mind is full of ideas and I will make the time to bring as many as I can to life. Lately, I have been thinking about the purpose of art and have come to the conclusion that artists, writers, poets, comics, cartoonists, musicians, storytellers and filmmakers have more of an important role to play in our world today than is realized. We need art to help illuminate the way to a greater human understanding. It’s a messy process, fraught with conflict, but not lacking of wit. As Oscar Wilde said, “The pure and simple truth is rarely pure and never simple.” We must keep creating art that recognizes and reflects the irony and tragedy, as well as the beauty of the society we live in. Goodness knows, there’s no shortage of material to use. I’ve already given this new movement a title: American Art – Post-election Period. You can see my contributions here. Also, a new drama troupe, The Wee Folk Players (They’re a Stitch) has formed and is adding cast members on a daily basis. To find out more about the series, please read this interview. 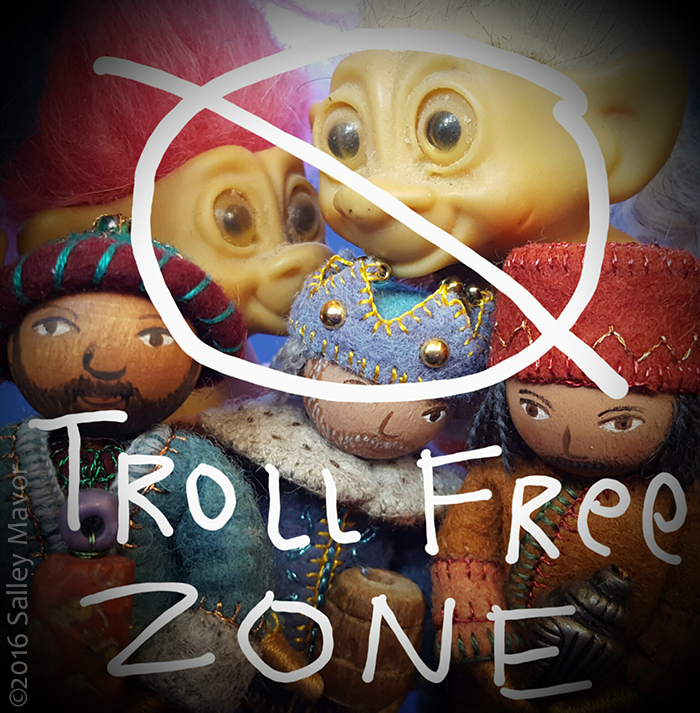 Attention Please: This blog has been designated a Troll Free Zone. Civil discourse in comments is encouraged, but swearing, ranting, name calling and hate speech are not. Now, allow me to introduce Wee Trump, whom I hoped would just go away. Alas, it looks like he’s here to stay for a while. He has a persistent nasal condition which may be permanent, but he and a lot of other people don’t seem to mind. Below are 2 portraits, from before and after Nov. 8th, 2016. Do clothes make the President? We’re sure to have interesting adventures together over the next 4 years. I know how much you like to see photos from behind the scenes, so here are a couple. The most challenging part for me was printing out the reference materials. OMG, this is wonderful and I am looking forward to the adventures! It may make it just a tiny bit easier to take. LOL, I am looking forward to the adventures, it may make it just a tiny bit easier to handle the impending doom! Bravo Salley! I think we all are going to push beyond our comfort zones to help balance some of the insanity which sadly seems to be increasing by the day. I am so happy you’ve done this. You’re right; it must have been an uncomfortable experience to print out this resource material! I too, love your work, and your spirit and am in absolute agreement with your thoughts and actions. Keep up the good work. This is no time for us to become passive or silent. We must continue to press for what is humane, kind, and just. Nailed it. I love this so much. I think you should do an “Emperor’s New Clothes” version. Perhaps you should do one with very small hands. Yes! We do need to “come out” of our safe corners in order to preserve the social ideals of our country. I applaud and look forward to your commentary. Thank you. Thank you Sally, looking forward to more adventures as you imagine them, and I agree about the small hands as a possible added feature. Artists can be activists in many ways. I plan on making art that will help me deal with the changes that may be coming – and my own feelings, so I can sleep! Terrific work Salley! Here in Canada we have a Prime Minister who talks the talk but then goes ahead and approves 2 new tar sands pipelines, 1 LNG terminal, the Site C damn and Arctic Seismic blasting. He tells us that these new extractive projects are in the best interests of all Canadians even though it will devastate the treatied lands of many indigenous nations and they are good for the environment based on scientific research! What a crazy time we are living in. Congratulations on your new art work Salley. Thank you! For all your lovely work over the years and for this new adventure, expressing explicitly the human values implicit in all your other work. Oh my gosh! I’m so looking forward to this journey. The nay sayers have the wheel right now, but I’m all for sounding the alarm just like Paul Revere. My very best to you, and the fairies. Thank you, Sally, for soothing our souls, and speaking out. We all need to be vigilant and vocal. Perhaps this is the silver lining; we will take charge of caring for each other. Onward! I support your decision to express what many of us are feeling, pre and post election. You have made a tasteful expression of all the distaste we have. Thank you. Wow. Love it! We are in for some interesting scary times. You will help to make the next few years bearable. Thank you for sharing your amazing work. Right on, Sally! However, it would seem you might be speaking to the choir, so to speak. The overriding question in my mind is how to reach those we don’t usually reach (those who may not want to hear what we have to say)? Therein lies the rub! I have no solution YET, but meditating on this conundrum as I do my own slow stitching, in frustration. Yes, Cindy, I do think about my more conservative followers who may feel betrayed by my leading the sweet wee folk into the mire. Some will choose to stop following me, which is fine. But I hope that others who disagree will stay tuned and see where this all goes. Thank you Salley for your statement and courage. As many of us look on in silence, it may be interpreted as agreement. Values are important and we can show them in many ways. Hope is important and daily works of courage can make this proceed. Salley, do you mind if your new work is pinned? I feel the need to start collecting such timely art works! Thanks for asking Kay. Yes, please share and pin my photos. I’ve been watermarking them for that very reason. Thank you so much, Salley – we all need to find ways to cope with this horrible turn of events. I am seriously scared right now. You “Go, Girl”!!! Looking forward to seeing the manifestations of your observations and perceptions. Thank you for sharing. I’m so sad that the wee folks will no longer be safe from the realities of politics. As someone who lives just outside the beltway of DC, there are few safe havens for big folks and wee folks alike where politics do not breach. Is this really the right time to level politics in the wee folk? Would it not have been so much better to introduce them at the beginning of campaign? Coming in at this late date to sling mud at the president elect just seems to be no part of what the fairies are about. Ah, but fairies are all about mischief. The wee folk feel their calling now, as these are extraordinary times. Any time is always the right time to speak up. Whether we do it with words, actions or art! Well done Sally. The extended conversation on facebook is proof enough that you’ve struck a collective chord. (Here in Minnesota, many of us are terrified, so say the mid-westerners ;-)). The wee folk are perfect messengers. Your insight is thoughtful , intelligent , witty and so needed , thank you . I love this and am forwarding it to like-minded friends. We look forward to sharing further installments on your journey. Thank you. Thank you so much. I ordered “Displaced” postcards to send as holiday cards this year. I think those of us who make art have to let their work become a light in the darkness of this new and far too ugly world. Haha. Your work is so wonderful! Thank you!! I love your art and am so happy to see you speaking out. Keep up the wonderful work! High five. Give us hope and courage. Right on! I too am scared to death what will happen to our country. You certainly nailed Trump. Looking forward to your adventures. Onward fairies! And onward to those with whom the fairies conspire to speak out with the truth! When I view your latest piece of commentary, I imagine his nose growing and growing with each lie until it grows too long to fit within the edges of the photo, and then too long to even fit within the the edges of the computer monitor. (Furthermore, I imagine such trajectory of growth would not take long, given the rate at which that horrible man spouts untruths). Thank you for speaking out through your art. I, too, have been shaken out my complacency and trying to find my voice. It is so important to be vigilant and find ways to get to truth through the noise and blatant lies and misdirection that swirl around Trump. He rated more Pinocchio’s than any other candidate from fact checkers. Our country deserves better and I hope that those who put their trust in him will also be watchful and delve deeper to understand the true consequences of the actions and positions he takes. Brilliant, Salley! And helpful too. Right on, Salley! I’m totally with you–I need to find a way to make my work reflect my politics, though when Miss B gets mouthy there is a LOT of pushback. Yes, as a teacher, I can imagine that Miss B must practice diplomacy. But then, she may get to a point where she’s had enough! Bravo Salley! I, too, am finding it difficult to live with the outcome of the election. I fear the legacy Trump will leave for all Americans. This is a person who is out-of-control and he seems to believe he is above political and cultural norms. and that is spectacular. Thank you for a political statement most of us want to make. Love your new direction! Slyly whimsical, or whimsically sly. Also admire your action, I’m not there yet but good for you! Thanks. Thank you for stepping up and saying what I feel. Love it!!! Thanks for this, it has given me a smile on another hard day. Yes it’s safe to come out of the water, there are many like you who stayed away from politics until after…then well even I posted an ‘elected official’ to an international closed FB group that I admin with the title of the post ‘this made me laugh’. I had one angry response and the demand was for equal weight given to the other side. Well I said if you can find a doll that’s an equivalent please post, oh and make sure it’s got a pantsuit please. Please note I’m an Aussie and love your craft! Your work touched a chord with me from way back when you appeared on the Carol Duval show. I love to sew and create art pieces but more than that Iove the magical worlds your little people live in. I have bought nearly all of your books, have visited your shows, and have faithfully followed your blog. I have heard you speak at different venues and feel you have brought picture book illustration to a whole new beautiful and creative level. I feel your work has a sweet quality that centers around childhood and memories and goodness. The materials are warm and cozy, whimsical, and earthy. Your work makes people feel good and has a unique quality that is difficult to copy. Children love to look closely and see the details. Adults go back in time to their own childhood wonder. As an artist I know how long it takes to plan, stitch, wrap, and sew each little piece to make it work as a whole. And while you do this you ponder and think and put breath into your pieces. I also understand, as an artist how art allows us a medium for expression. But I felt disappointed with your last post. All of us are worried about our future. But we have been caught up in a contentious wave that only we can change. We can join in the anger and keep splitting the people of this country up, or we can try our best to come together and work together. I feel you tainted the sweetness of your creations and pulled them down. i feel sad that your fairies have to be swayed by your personal anger. Because I don’t believe they dwell there. Your work has not ever pushed people to make choices. Perhaps now it will. But you missed that childhood and children dwell in forgiveness and moving forward simply by their innocence. We should learn from them. Thank you for your thoughtful comment. I hear your disappointment in this new direction my work is taking and desire to stay in the world of childhood innocence. My work is multifaceted, sometimes sweet and other times biting, with an ironic twist. It really is true that the fairies made me do it. As my muses and conscience, their inherent mischievous nature has given me permission to reveal a part of myself that has been kept from public view, at least on this blog. And this is uncomfortable for you. I don’t feel angry, but I do feel wide awake and more creatively energized than I can remember! Every fairy story has a Wicked Witch, or an Ogre, or a Wraith. It’s life, and I’m happy you are allowing them to surface in your fairied realm. It reminds us that we need to band together to keep ourselves safe and sane, and to ultimately defeat the spirit of destruction that they harbor. I think you should go back to what you have been doing. The world has enough opinionated people thinking they are the watchdogs of America. I find your effigy of Donald Trump with a Pinnochio nose very rude. He is your president whether you like it or not. Grow up! Obama’s detractors slammed him from the time he ran and still today. Cartoons with him as a witch doctor, his wife and daughters with nasty personal affronts,, continue. Thank you for expressing what so many of us feel in a way that is strictly political, based on truths,( i.e.Trumps see-saws campaign, I said this, next day, I did not,) not racist feelings. Trumpites, you must afford the rest of us the freedom you enjoyed all these years. To silence people with sincere concerns will take us back to Germany of WW2. You were not silenced. If you don’t agree, that is your right. But our vets fought for our right to speak, too. Amen, no more hate speech!!! The Pinocchio like nose is so perfect, made me laugh out loud. Thank you for this Salley. Art is therapeutic and those of us who are terrified about the direction our country is taking need art to help us through these scary times. Sally I love your little Trump dolls! 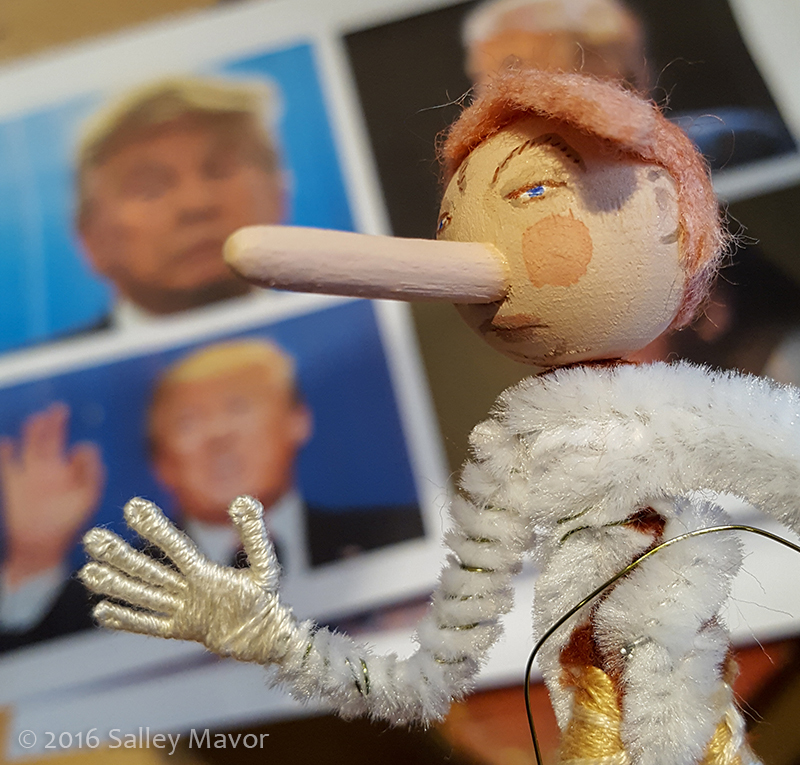 I’ve also made a Trump puppet (as well as Bernie, Hillary and Barak) but have been very hesitant to make statements with them because I just didn’t know if I wanted to deal with the negative backlash. I also feel like expressing myself through my art; your Trump dolls are motivating. Maybe it’s time that I do the same, I feel things are getting out of hand in Americal. Thank you, Salley, for your bravery in using your tremendous artistic talents to speak the truth. I’ve loved your work for years and will continue to do so as you and the fairies explore new territory. Art in all its forms has long been a way to express thoughts, emotions, ideas. I applaud letting your conscience be your guide. 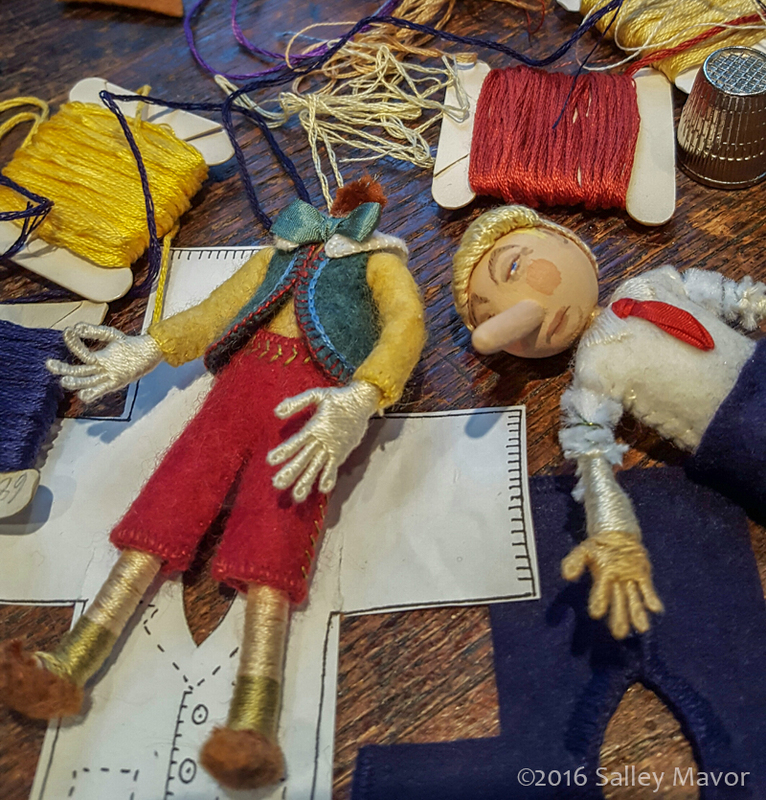 Covered Up, The Displaced, the Nasty Fairies and now Pinocchio-Trump have really stirred my soul. In particular, as you know, I’m giving all my family members postcards of The Displaced and making a donation to the International Rescue Committee in their honor. Art speaks, and sometimes that speech can be discomfiting; other times it can be empowering. Thank you so much for sharing your art, and your thoughts. Artists do matter….and they have been addressing societies ills as well as celebrating it’s greatness for centuries. Thanks for contributing to the conversation! Admittedly…I didn’t initially get the Trump connection when I saw just the photos of Pinnochio and the “business man” side by side, but once I did it was a good laugh, and a serious reflection! and un-professional. We are a democratic society and choose to elect our choice of candidate. you leave the country like so many celebrities have threatened. and who knows, he will do good things for our country. Wee Trump is appreciative of your support and is overjoyed to finally hear from a sensible person. Ah, but she can make art that keeps the spirit of resistance alive. She can create art that forces us into discourse, and she can make art that speaks to our spirits. If you subscribe to the belief of “America, love it or leave it” then you probably aren’t subscribing to the same model of democracy as I was taught. Bravo. I think many of us have been jolted out of our comfort zone and I can’t think of a downside. I see more passion to do the right things, to speak out, to make a better world than I have in a long time. As a Canadian, I feel that I am waiting in the wings for Trumpism to collect itself into a ball of failure but hope at the same time for your nation to find some way to grow and morph into a new life order. So please continue, Salley on your artistic comment. We will always love the Wee Folk. Well stated, as always. In many ways, artists are the canary in the coal mine. It is our right to express our thoughts in whatever artistic medium we choose. Not everyone loved Picasso’s “Guernica,” either, but it certainly made a point. I am currently working on a piece that addresses racism in a subtle way. And I love how the red cap barely fits on the swelled head. I did find your whimsical world quite the respite from the world, but part of what I love about your work is your unbridled and daring creativity. Even going in the direction of textiles and needle and thread is daring. And I know that if your spirit is prodded and brimming, that it must be heard! And my heart yearns for to see the outpourings of a free spirit whether it bring forth a gentle message or a sharper message! Be free, Salley! Thank you so much for creating, Salley. I value your work and your sentiments. Had I seen this sooner, I would have had a better week! Thank you, thanks you! I love seeing the evolution of your art. It is so important, I think, for art to reflect our world. It certainly makes it easier to take. You go, girl!